Keep it simple when charging your phone on the go with the Promotional Energy Brick. 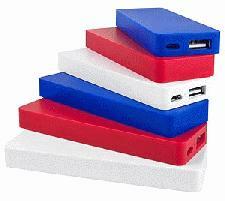 Promotional power banks are a hot product at the moment, staying charged on the go has never been easier. This brightly coloured promotional item is a simple way of creating brand exposure wherever you go. With a silk screen print across the product, available in blue, red or white, your brand is sure to turn heads. The power bank has a 3000 mAh capacity battery and is able to be charged over 500 times! For more information or enquiries on our Promotional Energy Brick, fill in the form and we will get straight back to you.